The best turkeys you can find, tattooed by amazing artists, to raise money for food banks in NYC. WANT YOUR TURKEY TO HAVE A TATTOO THAT LOOKS LIKE A PORTRAIT OF YOUR AUNT BARBARA? LOOKING FOR A TATTOO DESIGNED BY A SPECIFIC ARTIST? NEED 197 TURKEYS WITH YOUR COMPANY’S LOGO TATTOOED ON THEM? What’s better than spending the holidays with friends and family over a beautiful and bountiful table? The food we eat is as important a tradition as the thanks we give and the memories we share. Now, we’re introducing a new take on a holiday classic to make this season unforgettable. 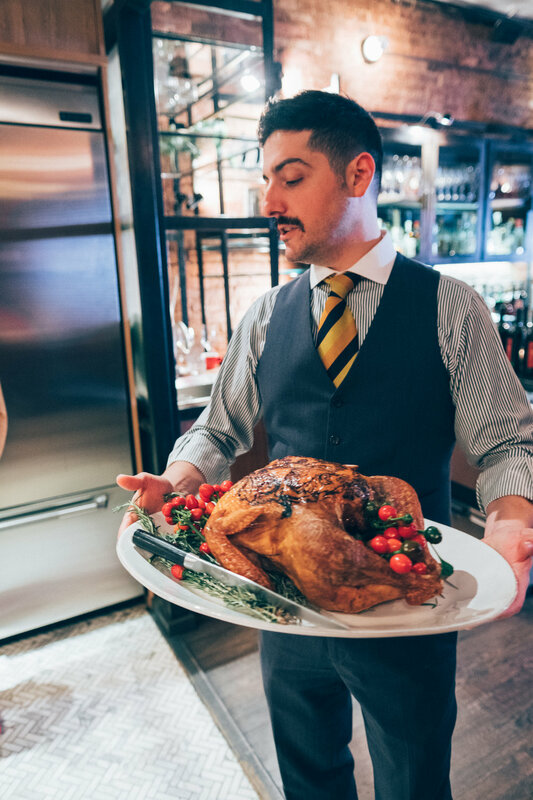 This year, we’re collaborating with the finest turkey farmers in the country and some of our favorite tattoo artists to make a Tattooed Turkey the centerpiece of your holiday meal. That’s right, you can now order an organic, free-range turkey, tattooed with a one-of-a-kind design by amazing artists using food-grade ink. And it will be delivered to you just in time for the holidays. We assure you, Tattooed Turkeys are not a joke. They’re a limited culinary art series (and they’re a unique opportunity to absolutely blow your guests minds). To us, the only thing better than sitting down to a delicious meal with loved ones is helping people who are less fortunate. That’s why we donate 10% of the proceeds from each Tattooed Turkey to provide food for those in need. Starting new traditions, spending time with your favorite people, and helping to feed the hungry: These things shouldn’t be reserved just for the holidays. Tattooed turkeys are the best way to present a delicious custom centerpiece at any celebration.